I had the proverbial foot out the door on this NBA All-Star Weekend, anticipating more flash than substance. . .
three point contest – AWESOME. A 27 from Klay, including EIGHT IN A ROW to pull the title away from Steph? Holy moly. And this after a three-way tie to get into the qualifying round with 20? 20 used to win rounds!!! a) best one-on-one since Jordan vs. Dominique. Seriously. b) I don’t think you have 10 dunks stronger than the top 10 from Saturday in ANY contest. Ever. Game itself – sure, no defense. . .but the west almost drops 200 points?!?!?! Cmon 196!!!! I don’t give a heck, that is amazing. They shot 80 3’s. EIGHTY. Really fun just to see the chase, here. What a weekend for the NBA. Wow. ‘Fantastic,’ if you will. to recap: he jumped OVER the mascot AND went under BOTH legs. reminder = when Isaiah Rider went under ONE leg, it was mindblowing. Wow. secondly,I’m not a HUGE fan of gimmick dunks – but the timing, smoothness and execution on this are amazing. Great, great dunk. WOW. again. Oh – and for the record, a dunk by Andre Drummond which featured Steve Nash doing a behind the back soccer/fútbol kick to set up the dunk didn’t even make the top 8. Cornerback Alterraun Verner had eight tackles (plus one on special teams) and an interception return (12 yards) to the one-yard line that set up a Tennessee touchdown to five Tennesse a 27-20 lead in the Titans’ 34-27 win at Dallas. Defensive end Dave Ball had three tackles and tipped the pass that Verner intercepted in that win. Marcedes Lewis had two touchdown receiptions and 54 yards receiving in Jacksonville’s 36-26 win at Buffalo. Running back Maurice Jones-Drew rushed for 84 yards on 19 carries and made two receptions in the victory. Linebacker Spencer Havner had five tackles in Detroit’s 44-6 win over St. Louis. In Cleveland defensive tackle Kenyon Coleman made four tackles, recovered one fumble and had one quarterback hurry. Brian Price had a quarterback hurry in Tampa Bay’s win at Cincinnati. In Oakland Bruce Davis played but did not make a tackle. He signed with the Raiders on Tuesday. Washington safety Chris Horton played but did not make a tackle. Denver receiver Matt Willis played but did not make a reception. Minnesota (punter Chris Kluwe) plays tonight. Week Five Inactives: Arizona Safety Matt Ware; Washington tight end Logan Paulsen (Washington); Green Bay linebacker Brandon Chillar; Chicago running back Kahlil Bell. Week 5 Byes: New England safety Jarrad Page; receiver/kick returner Matthew Slater. Thank you once again UCLA Athletics for the information on the Bruins’ NFL exploits over the weekend. Well, Angelenos, one monopoly really is over. . .the latest issue of U.S. News & World Report has USC ahead of UCLA in their renowned University rankings for the first time ever. Though the new rubric used to determine the rankings has much to do with this shift, but the budgetary mess strangling the State of California may really be putting a dent in public UCLA’s efforts to keep up financially with the privately funded Trojan coffers. With all that’s happened with their Athletic Department recently, perhaps Southern Cal will now focus their efforts on being the premier academic institution in the Southland. . .okay, that’s a stretch but still – WOW. 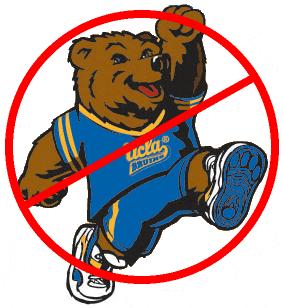 Fight on, BRUINS. Coach John Wooden Passes Away at 99. *FTR: Though this post originally went live at 3:07pm PST June 3rd, as late as 9:22am PST on June 4th, formal/official reports stated Coach Wooden is in “gravely ill” condition while paradoxically “resting comfortably.” That said, both Bill Walton and Bill Sharman spoke of Coach in the past tense. “We said goodbye today,” Sharman said. “I think he realized it. As a UCLA alum (Class of 2000), I was privileged to meet Coach Wooden at Pauley Pavilion on one instance, where he handled himself with the class, integrity & elegance for which he is known. I didn’t get more than a “nice to meet you” and a (surprisingly) firm handshake, but even during that brief instance it was evident that this man was genuine, sincere & a good person. I was also fortunate enough to be able to experience the Scully & Wooden. . .for the Kids with my father (The Count), who presented me with the tickets as a gift. . .and a cherished evening, as both Vin and Coach regaled the audience with anecdotes of their wonderful careers, philosophies & outlooks. I remember Bill Walton’s video tribute to Wooden, where he most remembered coming onto the UCLA campus as a highly-touted freshman ready to be Big Man on Campus, wondering what the legendary Coach would have him do first. . .which ended up being an entire session dedicated to putting on his socks & tying his shoes properly. More notably, the moderator (TJ Simers) asked the question, If heaven exists, what would they like God to say when they arrive at the pearly gates? Wooden’s response? “Well done,” sparking laughter, applause & a knowing & collective wink from the rapt audience. Now that the unfortunate circumstances are indeed upon us, I think that God will consider that an understatement. Here’s to Coach Wooden, R.I.P. The year was 1988. The date – November 19th. A prototypical day in Southern California – a 66 degree temperature with clear blue skies. The Troy Aikman-led UCLA Bruins were set to meet the Rodney Peete-quarterbacked USC Trojans. Both teams were ranked in the Top 5 in the nation, and at a robust 10 years of age, I was finally old enough to understand the gravitas of such a matchup. Basking in the afterglow of consecutive L.A. Lakers titles as well as a Dodgers World Series victory, I was on top of the world as a sports fan. This was my city – these were my teams! Even the Los Angeles Kings were in the news, as Wayne Gretzky was acquired by the franchise, setting the world of hockey on its proverbial ear, and for the first time in the history of the sport, shifting the media attention to the City of Angels. Everything in Los Angeles sports came up Roses. . .quite literally in this case, as the matchup at the RoseBowl would determine the Pac-10 representative in the de facto National Title game. My parents – both ardent Los Angelenos – hosted a get-together at our house to watch the ballgame. About 15 adults showed up, as well as four of my friends. The house was divided into rooting sections; about half for the Trojans, and half for the Bruins. Though the Trojans were slightly favored, Rodney Peete came down with a nasty case of the measles prior to the game and was questionable, leaving Pat O’Hara as the potential QB for the biggest game in Pasadena in a decade. Terry Donahue and Larry Smith legends already, were set to meet to determine once and for all who really was the supreme team in Los Angeles. As my parents’ guests arrived one-by-one, the news came straight from the ‘hood: Rodney Peete can play! His Heisman hopes – as well as the dreams of the Trojan faithful – are still alive, and gosh darn it, he’s going to lead them to victory. Well, it was at this moment that destiny smiled upon me. With 19 guests situated in their respective sections, the count (not to be confused with The Count) was 10 Bruins fans and nine Trojans supporters. For no other reason than my obsessive compulsive need for symmetry and balance, I sat in the USC section. Lo and behold, the Sons of Tommy Trojan led a dramatic 31-22 victory and claimed the Victory Bell for another year. Me? I was neither happy nor sad for the Trojans, per se, but being able to bask in the afterglow of more Los Angeles revelry etched a permanently positive memory in my subconscious, and since that day I can not root against my fellow Angelenos. According to a Princeton Review survey of 9,132 college applicants and 3,042 parents of applicants, UCLA ranks No. 1 among public schools and in the Top Seven overall in the category of “Dream Schools” for both the applicants and the parents. For the survey’s only fill-in-the-blank question, “What ‘dream college’ do you wish you (your child) could attend if acceptance or cost weren’t issues?” respondents wrote in the names of more than 600 institutions from Adrian College to Yale. Steve Lavin took much heat as he was unceremoniously fired from UCLA. He’s been taking heat since from Bruin fans who think of ‘The Lavin Era’ with scorn and disdain. I look at the seven years with Lav as a good time; six tourney appearances, six 20-win seasons and five Sweet Sixteens. At UCLA, the expectations are higher butLav was a first-time head coach TWO years removed from being a third-assistant. He was given an opportunity that was AT THE TIME was over his head. He learned, he knows the game and he will succeed at St. John’s. See ya in the Final Four 2014, Red Storm. Enter your email address to subscribe to YKI. james conetta on Dodgers. 2019.
designstILes Style, design, decor, interior design, fashion, Love. Tio's Mexican Food Four locations, great food & catering. Serving L.A. for 25 years.